Hunters Moon offers a majestic welcome as you enter the grand doors between the sandstone columns. This Georgian style manor is reverse level in layout and once inside a central hallway leads to 2 beautiful bedrooms worthy of any boutique hotel. The bedrooms offer a king bedded room dressed to perfection with vintage French style bed, ornate gold dressing table and striking monochrome wallpaper. The 2nd bedroom offers a zip/lock option creating a king or a twin, again this room has been stylishly designed with an rich palatte of plums, fresh white and bronze. The contemporary bathroom is no less considered with black marbled tiles and walk in shower. Each bedroom offers bath robes, slippers and Aqua di Parma toiletries. A central staircase sweeps up to the first floor and the open plan living, dining and kitchen space. 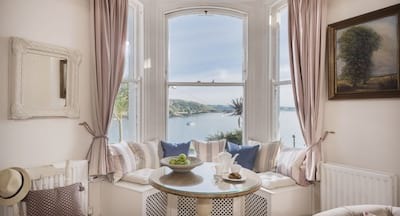 This room is flooded with natural light from the unique arch window which perfectly frames the sea view. Relax in the comfort of the living area and immerse yourself in serene holiday life, gather as a group after the day's coastal adventures or simply enjoy some overdue time to catch up. The dining table welcomes celebratory dinners or kept casual for lazy breakfasts or brunches. The kitchen is fully fitted and includes all you need to get creative using the very best of Cornish produce. Hunters Moon brings luxury and style together whatever the occasion. From the open plan living space a step out balcony is the perfect place to capture the morning sunshine or coastal sunset. The paved sunken garden is to the front of the manor and truly is a beautiful setting. The hot tub bubbles in a quiet corner and relaxed seating captures the day long sunshine. Hunters Moon is located in the charming heritage village of Charlestown, more recently known for its film set backdrop on occasion the harbour comes alive with lights, camera, action. Charlestown offers 2 beaches both with crystal clear swimming waters more often sheltered by the headland. Wander along the harbour and enjoy a coffee or Cornish ale in the local pubs or cafes. The South Coast of Cornwall has so much to offer with a plethora of sandy beaches including Porthpean, Pentewan, Hemmick and Gorran Haven, heading further South The Roseland Peninsula is simply stunning as you follow the road towards St Mawes with its maritime vibe. Fowey is a short drive away and well worth a visit, try your hand and kayaking on the river or a day sail out across St Austell Bay. The Eden Project is a wonderful day out for all ages, immerse yourself in a botanical wonderland of tropical palms and plants. If golf is your favourite was to wile away the day, The Carlyon Bay Golf Club is within easy access and guests of Hunters Moon can received preferential reduced green fees. Whatever the season or occasion, Hunters Moon comes highly recommended for your luxury holiday. Reverse level layout. Hunters Moon overlooks a large Koi Pond and children should be supervised at all times. Hunters moon is stunning, perfectly equipped and decorated. Thank-you a million times for the wonderful time we had in Cornwall! We enjoyed our stay very, very much - it couldn't have been better! Hunters Moon is absolutely beautiful and has everything you could ever wish for. Thank you for making available this stunning retreat. We are sure to return. This is a truly beautiful retreat - the word base comes no where near to the incredible detail at Hunters Moon. It was a perfect place to unwind - the tub it a must! Hunters Moon is one of those properties that you want to recommend but are torn to compromising this lovely ‘gem’ too! Thank-you a million times for the wonderful time we had in Cornwall! Hunters moon is stunning, perfectly equipped and decorated. We enjoyed our stay very, very much - it couldn't have been better! Wonderful property and location. Delightful, helpful and informative host. Very well equipped property. The property was excellent, just what we were looking for. We had a great stay, thoroughly enjoyed it. The property was far better in reality, beautiful! It was the perfect place for our honeymoon! This place is stunning! You had thought of everything and made it such a pleasure to stay. We had a lovely time in this beautiful house built with such love, care & attention to detail. We love the views framed by the windows and enjoyed relaxing in the hot tub with a bottle of bubbly, a perfect week. Fantastic standard at the house, everything was thought of. Didn't want to leave! A wonderful place to stay & a great base to explore the surrounding areas of Cornwall. Would certainly recommend to friends & family. The hot tub is amazing! 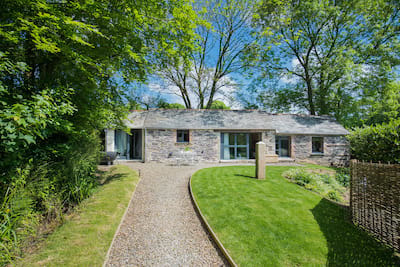 Hunters Moon is a beautiful place to stay whilst visiting Cornwall. With luxury features in every conceivable way, we could ask for no more. Our stay at Hunters Moon was perfect. I have no complaints or negative comments at all. Anyone fortunate enough to stay here will thoroughly enjoy their stay just as we did. The owner was friendly and made us feel very welcome! Everything you could possibly need for a self catering holiday was available. The hot tub was well maintained and perfectly situated behind a wall so you could never feel overlooked. Everything was presented beautifully and i was sad to leave after a wonderful luxury escape! Thank you! A stunning property furnished to a very high specification the owners of the property were very welcoming very quiet location within easy access of Charlestown with many restaurants. Would highly recommend.